May 2001 - Zalman Kaplan, a Yurburg survivor and Vilna resident, tracked down a family group of Yurburg descendants traveling in Vilna, after they had been to their ancestral town of Yurburg (Jurbarkas). He has heard of them through the "Litvak grapevine." 2003 - Zalman Kaplan approached that group of Yurburg descendants from Canada, Mexico, Israel and the US, to undertake restoration of the Yurburg Jewish Cemetery. March 3, 2005 - A group of Yurburg descendants incorporated the non-profit organization, "Friends of the Yurburg Cemetery, Inc" in the United States. 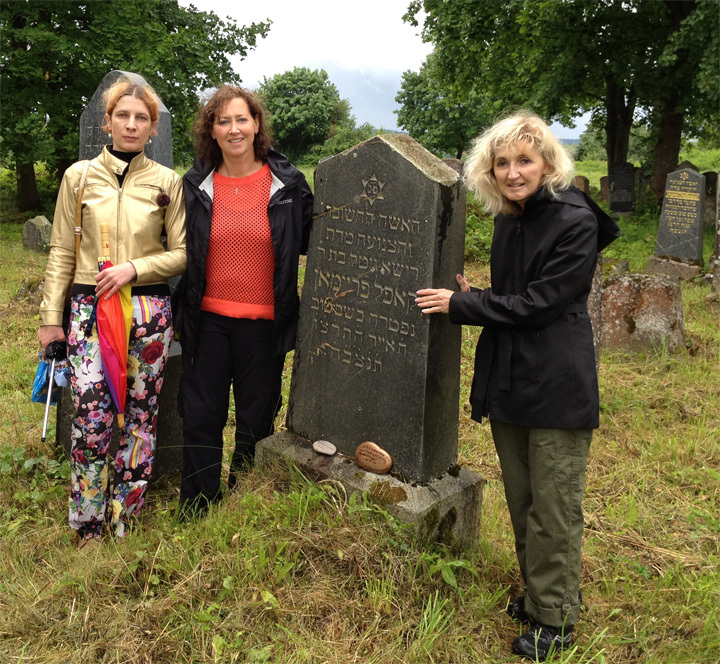 May 2005 - On a second trip to Yurburg, representatives of "Friends" met with members of the Yurburg (Jurbarkas) town council and agreed to cooperate with the renovation and preservation of the Yurburg Jewish Cemetery. The "Friends" organization immediately raised money to fund the restoration. With initial funds raised, the "Friends" made contact with the Jewish Community of Kovno (Kaunas), which formed a committee to manage the rebuilding of the Entrance Gate. September, 2006 - United States Commission for the Preservation of America's Heritage Abroad recognized the Jewish Cemetery of Yurburg as a site worthy of preservation. In the most recent news (Nov. 15, 2006) The Friends of the Yurburg Jewish Cemetery announces that the Dartmouth College Hillel has chosen the Jewish Cemetery of Yurburg as its summer, 2007, site for its ongoing Project Preservation. In January 2007, Rabbi Edward Boraz of the Dartmouth College Hillel and Ethan Levine traveled to Yurburg, Kovno and Vilna to make arrangements for the June 2007 restoration. Erected a new iron fence (over 700 feet long) with a Jewish motif around the cemetery to replace the decaying concrete and iron rod Soviet-era fence. See photos below. Located and dug up a number of buried headstones and cleaned them. Created a map of the cemetery and locations of the headstones, so it can be used to locate the graves on site. Overgrowth was cleared by the the town of Jurbarkas. Engaged the local high school and a number of its youth in the project. Photos taken during the trip are available. 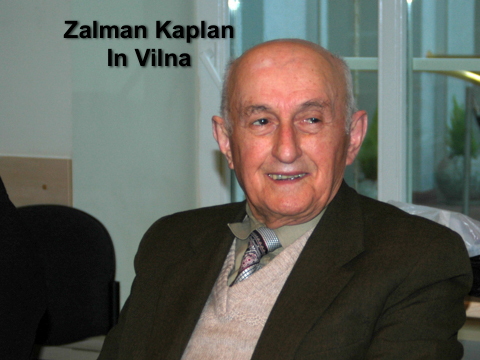 Joel Alpert visited Zalman Kaplan in Vilna to tell him that his request to rebuild the had been fulfilled! Click here for a link to photos taken by Rita Vaiva, who has been reinscribing the lettering on the headstones in the Yurburg Jewish Cemetery for since 2004. The photos are clickable. Click here to obtain more information. We have made a substantial beginning with the completion of the gate restoration; now with the official recognition of the United States Commission for the Preservation of America's Heritage Abroad, and under the direction of the Dartmouth College Hillel, we have the opportunity to see the fulfillment of our original goal of fully rehabilitating and restoring the Yurburg Cemetery. What Happened to the Jews of Yurburg? "How I Discovered My Roots in Yurburg"
"Photo Tip for Copying Old Photos with a 35 mm Camera"
Specially written article by Dr. Dov Levin (Hebrew University) and Josef Rosin, authors of the definitive book on Lithuanian Jewery, Pinkas Hakehillot Lita, Encyclopedia of Jewish Communities of Lithuania. Yurburg, Lithuania is located on the banks of the Neman (Nemunas) River. 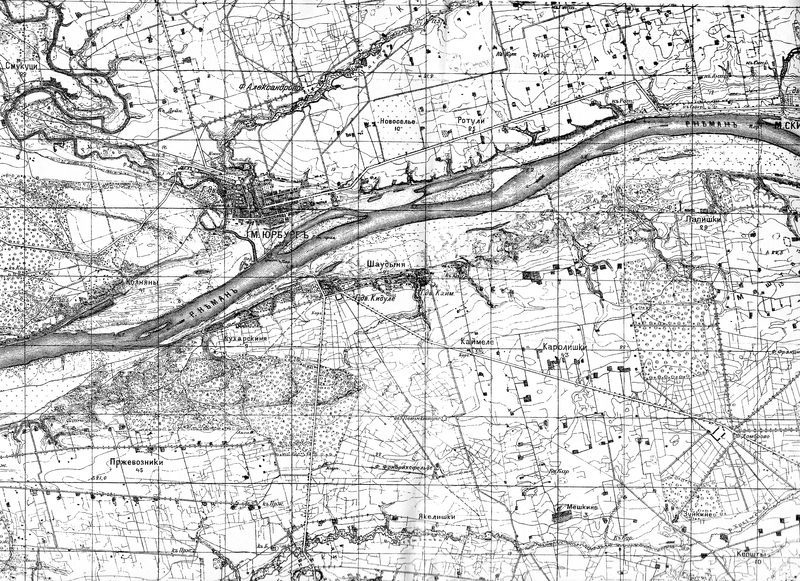 In the early 1900s, the Neman River was the border between Lithuania to the North and East Prussia to the South. In 1650 there were a few Jews documented living in the town. They became merchants and prospered in the town. They were owned lumber yards, purchased farm produces and resold them in the town, among other professions, and generally became the middle class, with the native Lithuanians being for the most part, farmers. The Jewish population grew to over 2000 by 1900, when conditions worsened and many began to emigrate to the America, South Africa, Australia, Uraguay, Paraguay, Argentina and to Palestine. 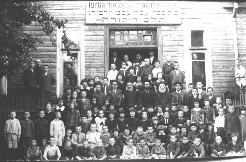 There were strong Zionist and socialist activities in Yurburg from 1900 through the end in 1941. 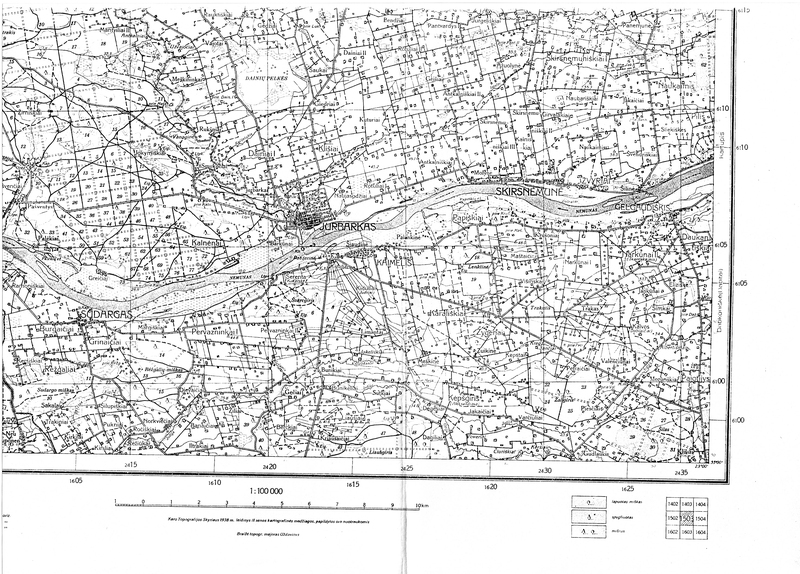 In an article by William Berton of Saginaw, Michigan, in the genealogical publication "Landsman" Volume IV, Numbers 2-3, on page 19, it is stated that "according to Berl Kagan, Jurbarkas (Yurburg) is one of the oldest Jewish settlements in Lithuania, dating back at least to 1593. In 1650 there were only about 8 to 10 Jewish families in 7 houses. In the 17th century, Yurburg Jews had the responsibility for collecting taxes from the surrounding towns. 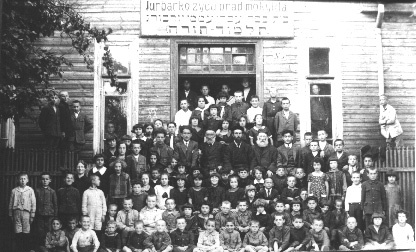 Jews from Kovno came there to conduct their business. Jewish population figures are given as follows: 2,333 in 1764-1766; 2550 in 1862; 1887 in 1927, 2,350 (31% of the total population) in 1897,and about 2350 before the Holocaust." Between June and September 1941, after the the town was occupied by the Germans, the Jews of Yurburg were murdered by Lithuanians. Berton also states that "other town name variations are Jurburg, Jurbarak and Jurbarski." There was a famous wooden synagogue built in the town in 1790. 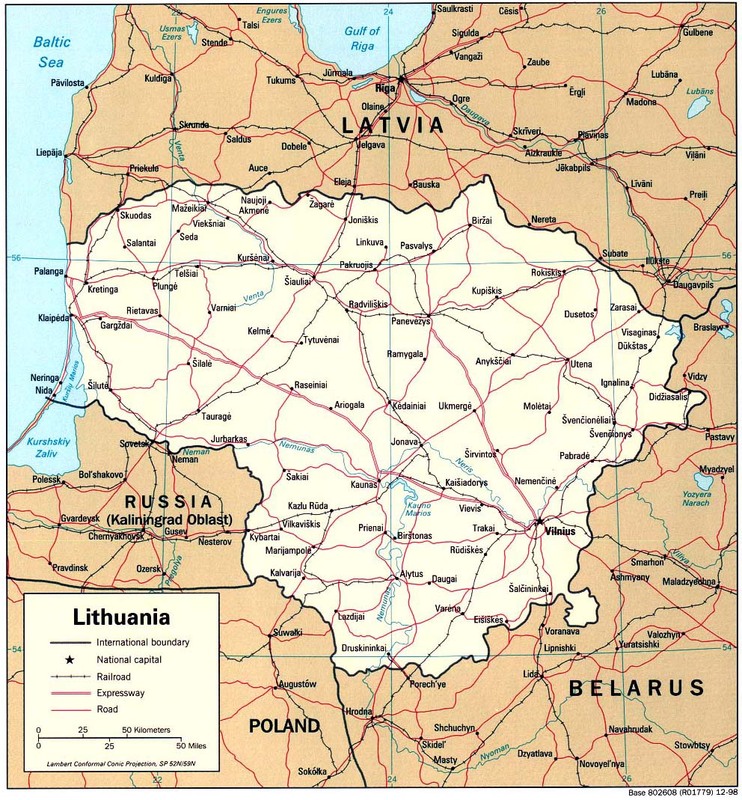 In the Encyclopedia Judaica, in the article on Lithuania, there are pictures of it. Also see article on Jurbarkas. Also there is a print (plate 73) of it in the book Wooden Synagogues, by Piechotka, published in Warsaw in 1959. The Nazi forced the Jews to tear down their beloved synagogue before all the Jews of Yurburg were murdered in July 1941 by the Lithuanians under the control of the Nazis. A videotape copy exists of 16mm. films taken by an emigree of Yurburg, when he returned for a visit in 1927. It contains footage of the town, including some dark scenes in the Wooden Synagogue mentioned above. Click here to go to view some film clips of that film. The Governor and his family had an estate on the river, in the town, and townspeople were allowed to use it as a park. On hot days after work, the townspeople swam in the river. The model of the famous Wooden Synagogue of Yurburg by Moshe Verbin (see above) is on display at the Ort College, Givat Ram, Jerusalem 95435 Israel (Telephone: 02-6754602) starting in April 2004. Click here for more information about the exhibit. Click here for information on the Yurburg Synagogue at the exhibit. Pictured above is a plaque made by Shalom Reisman of Yurburg, who give it to Dorothy Cossid, sister of Jack Cossid. She then give it to Jack Cossid, who in turn, give it to Joel Alpert on June 28, 2003. It has an image of the Great Wooden Shul of Yurburg along with three pine trees and the word "Yurburg" written in Hebrew script. The synagogue was built in 1790 and destroyed in 1941. Read about The Destruction of the Jewish Community of Yurburg - Translated from the book Yehudat Lita (The Jews of Lithuania) by Regina Naividel. This book was written by former Jewish residents and survivors of Yurburg to help preserve the memory and knowledge of their beloved destroyed community. It was published in 1991 in Israel by the Organization of Former Residents of Yurburg, chairman: Shimon Shimonov (Shderot David Ha'Melech 1, Tel Aviv, Israel; cost was $30 in 1993). The book is mostly in Hebrew, with a five page English summary. Consequently, until now most of the contents have not been available to the English speaking community. Here we are attempting to provide translations to the public. Translated pages are reproduced here with permission from the Organization of Former Residents of Yurburg. Those of us who lost relatives from the town of Yurburg never knew what happened to them; now fifty years later, we learn the horrible truths. 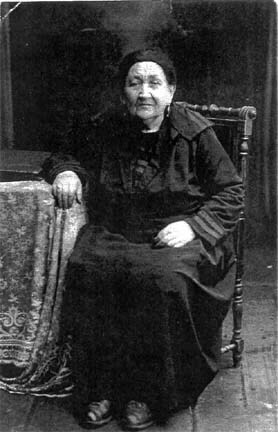 Translations from the Yurburg Yizkor Book are provided thanks to the generosity of members of the American branch of the Krelitz Family, whose grandmother and great grandmother was Leah Naividel Krelitz of Yurburg. For the full list of translated material, click to view the Contents of the Yurburg Yizkor Book and use to the hypertext to access the translated material. You do not have to be a bibliographer in order to understand that Yizkor Books of Jewish communities which were destroyed in the Holocaust are still being published, but there is no doubt that their number has decreased. One of these books is the "Yurburg Yizkor Book", published recently, and probably most readers were not even aware of its existence. The main innovative uniqueness of this book expresses itself in the quality of its editing as well as its content. It has two parts, written at different times, with an interval of several decades between them. Every part embodies much assorted material of this old and special community, due to its location, the composition of its population and its economic and cultural situation. The first part of the book was published in Jerusalem in 1991, in Hebrew, by "The Organization of Former Residents of Yurburg in Israel" with the active participation of, and edited by, Zevulun Poran (Petrikansky). This translated part extends to over 2/3 (556 pages) of the English book under discussion. The editor of this book, Joel Alpert, helped by assistant editor Josef Rosin, was particularly careful to include all Hebrew and Yiddish material, insisting that the translation should be exact and that names of people and places would be properly translated into English. It was his intention to include general information about the town and its Jewish community; memoirs and authentic descriptions written by members of the community who grew up in the town almost until the time of its destruction; hundreds of thrilling photos of generations of families and of the day by day life of Yurburg Jews. But what may be of special interest for the genealogists among the readers are the lists of names of Yurburg Jews: those who were privileged to die naturally and be buried in the community cemetery, as well as those who were murdered by the Nazis and their Lithuanian neighbors from way back, and also the few survivors. No less interesting and thrilling is the additional material collected and added to the second part of the book by the industrious editor and compiler Joel Alpert. Thanks to his energy and personal motivation to widen the circle of more participants interested in commemorating Yurburg Jewry, the 180 pages of the second part include memoirs, documents and photos of former residents of the town and its vicinity, of people who have been living in the USA for a long time, such as Naividel, Eliashevitz, Laden, Feinberg, Krelitz, Rosin-Hilelson, Craine and others. This part also contains several essays written by Israeli residents who have a special affinity to the Yurburg community, either as a result of family connections or because they are engaged in historical research concerning this community: Professor Ze'ev Bernstein from the Tel-Aviv University, Professor Dov Levin from the Hebrew University in Jerusalem, Gita Abramson-Bereznitsky and others. Particular mention and praise should be given to the B.A. thesis "Holocaust in Jurbarkas" prepared in 1998 in Vilnius University by student Ruta Puisyte under the guidance of Professor Meyer Shub from this University. Apart from the historical importance of this work it is praiseworthy to note that this Lithuanian young lady showed a great deal of personal courage, integrity and bravery to reveal those local Lithuanians by name, who were the murderers of their Jewish neighbors. It is also worthwhile mentioning the wide ranging and moving essay "A Journey to My Past" by Fania Hilelson-Jivotovsky. In summary, it seems that judging from the quality of the material included in this book, it can be considered a small encyclopedia, which could serve as a model for similar books. As can be understood from the short review above, there is no doubt that we are speaking about a significant innovation, thanks to the courage of the editor in presenting a book to the reader containing facts, memories and the description of a way of life covering a period of about a dozen generations, who were residents of a Jewish town and who today are spread all over the world, the common denominator being: "One generation passes on its history and ideas to the next." According to Jack Cossid, who emigrated from Yurburg in 1937 at age 19, the town was almost totally Jewish. They were the middle class, the merchants, whereas the non-Jews were mostly farmers and lived in the countryside around the town. In 1920, the town established a secular high school, the Gymnasium, in which secular topics such as physics and calculus were taught. The town had at most about 3000 residents, most of whom were Jewish. 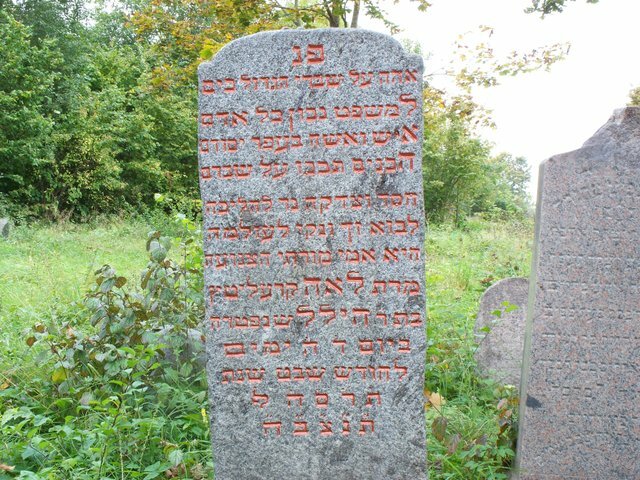 In June 2007 Dartmouth College and its Hillel Foundation as part of Project Preservation, came to Yurburg with 14 students and several faculty members under the leadership of Rabbi Edward Boraz and conducted restoration of cemetery. A total of 700 feet of new fencing was constructed around the cemetery, replacing the decaying pre-war fence and buried headstones were re-erected. Photographs of all headstones were taken and cataloged, translated and placed on the web with a map to help visitors locate specific headstones. A list of names of the headstones is on the web organized by sectors of the cemetery and can be searched for specific names. One can view the photos and translations of the headstones. Local high school students volunteered to help in the effort. Town officials welcomed the restoration work. Photos of the work are available on the web. It is well known that the Nazi not only murdered the Jews and destroyed their towns, but also desecrated and destroyed the Jewish cemeteries all over Europe. In 1994 Milton Blackstone of La Jolla California, travelled to Lithuania in search of still existing Jewish cemeteries and came upon the intact Jewish cemetery in Yurburg. In the summer of 1995, Don Levinsohn commissioned photographs to be taken of the headstones in the Yurburg Jewish cemetery. Joel Alpert provided The List of Names - appearing on headstones from the readable photos. Also make sure you search the All Lithuania Data Base of JewishGen for the names of your family. There is more information from the cemetery headstones recorded there. Right: Gravestone of Sarah Beylah Naividel Rosin, daughter of Hillel Naividel. Left: Gravestone of Leah Naividel Krelitz, daughter of Hillel Naividel, and mother of Krelitz family members mentioned above. REVISED....Enlarged Images of the Headstones and their photos. Photos supplied by Mimi Moses, of the headstone of her great-grandmother, Risha Gittel Kophelonva (1853 - 1936) and photo of Risha. Monument inscription: "The Important and Modest Woman, Mrs. Risa Gittel, the daughter of Reb. Koppel Freeman Died with a Good Name on the 8th Day of Yaar in 5696 (1936). May Her Soul Be Bound Up in the Bond of Everlasting Life...."
The relatives (her brother and sisters) in the picture stayed in Lithuania and perished during the Holocaust. This headstone was among those rephotographed in 1995. The Destruction of the Jewish Community of Yurburg - Translation from the book Yahudat Lita (The Jews of Lithuania) translation by Regina Borenstein Naividel. The Washington, D.C. museum has a database of documents you can search for references to Jurbarkas (Yurburg). Click here to launch your search, or here to learn about the museum. Click here to find our how to view the Yurburg Yizkor (Memorial) Book at the U.S. Holocaust Museum Library and the Hebrew College in Brookline, Massachusetts. 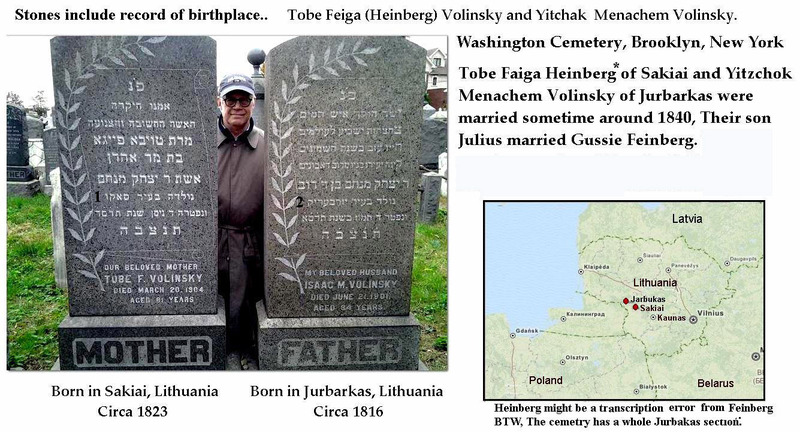 Search the All Lithuania Data Base of JewishGen for the names of your family. There is more information from the cemetery headstones recorded there. Please enter your family names and your name on the JewishGen Family Finder (JGFF) for jurbarkas. We will be removing the list below shortly. You can find other reserachers below by searching JFGG. Would you like to connect with others researching jurbarkas? Click the button to search the JewishGen Family Finder database. I have just studied your web page with great interest as my grandfather came from Jurbark. My grandfather, was Jacob VELONSKY (b c1878) who came to London UK when aged about 20 and remained there until his death in 1935. His twin sister Esther DIAMONDSTEIN however went North to Leeds UK before moving to USA. We know from gravestone inscriptions that their father, Abraham, was a Cohen. I have discovered from naturalization documents, thanks to generous help from two experienced JewGenners in San Francisco and LA, that Esther was born in Jurbark. I have also managed to track down Esther's granddaughter who is alive and well in CA. Esther and her family came to the US from Toronto, Canada on the Canadian Pacific Railway, arriving at the port of Detroit, Michigan on April 1st, 1904. "From your old uncle Mordechai Bar Jacob Kommel for my devoted dear nephew Alchanan (Alex Kommel), his wife Lea Rachel (Lillian) and daughter (Margot)." "Dear Children: Thank God I feel better, but still not competely well. But what can I do-old is not young. I don't want you to worry about me because I know that the economy in America is not good, and so are your business. God bless you for everything that you have done for me. If not for you I would be dead already. God should help you and your business. You should become rich like Rothschild, then it will be good for everybody. Today I received $100 that you sent to me and I paid my debts. Thank you for your good heart and for not forgetting about my difficult situation. In the day of your father's death and my brother Aaron's anniversayr of death I will go to the Synagogue to pray and to say Kaddish in his memory. Regards from my daughter Chana Rachel. She is now for eight days in Kovno by a doctor. Her husband still does not work but maybe he will get a job when the summer season willstart. Regards to my nephew Chanoch-Zundl and his wife Rosa and son Aron, regards to my nephew Jacob and his wife Hena and their children Ahron and Meier. Regards to my nephew Alchanan, his wife Lea Rachel and daughter. Regards to Abraham Nisen and his family, Jehuda Leib, doctor and family, Tzila, doctor, Esther, with her daughters Lea Malke with the children, Chana Rachel, Frank Schwartz with her husband, Doctor Michal and his wife Eta, children from Iochai Shmuel, ala ha shalom, regards to my newphew Isaac Kommel. Dear Child, If it is not too hard for you to make easier my difficlut situation it will help me alot. I can't ask you because of what's happening now in America. Give my regards to your bothers and sister Sarah." Having spent several hours reading the material that has been translated from the Yurburg Yiskor book, I can't tell you how impressive it is. It wasn't all a pleasant experience, but deeply moving and important nonetheless. I just have been into the Yurburg Shtetlinks Page and the Yurburg Yizkor Book. I am so drained and sadden to read of the stories of the Jewish people in Lithuania. I have watched documentaries and read about the Holocaust, but it still upsets me to hear of how evil man is to man. God have mercy on us all. About a week or two back my cousin Mr. Jeffrey R. Stern sent you an E-mail regarding our great grandfather who we understand was a Doctor in Jurbarkas before World War II. We share an aunt who lives in Newington, Ct. who is the source of this information. Her father was named Israel Harold Arenstein (or Arnstein). His brother was named Louis. Both came to America from Lithuania. Israel was my grandfather,and Louis was Jeffrey's grandfather. I do not know when Louis came over, but it was before Israel. I work in public administration for the Commonwealth of Virginia, (live in Richmond) so I know word of the mouth documentation may be true, but it is not what I think I know, It is what I can document that matters. I have viewed your website on Jarbarkas since last December and have wondered if a connection between our family and it's roots could be documented. Last week I obtained the documentation that establishes the link. Louis Arenstein became an American citizen in 1918. 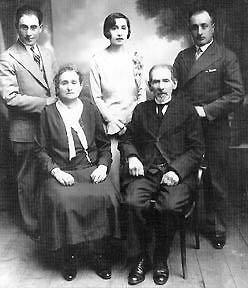 My grandfather Israel arrived in New York City in July 1911, But did not become a citizen until 1944. Last week I received papers from the INS.When World War II broke out in December 1941, Israel was still considered an alien. As an alien Israel had to file papers informing the U.S. Government who his overseas relatives were. The papers that I received are not very clear but this is what they say as he listed them. Dora " " sister Known "
Morris " " Brother Yurbarkas, "
This declaration was dated December 30, 1941. In it he also stated that he was born in Yurbarkas in Known, Lithuania on 11-25-93. This documentation indicates (does not prove) that our family had family in Jarbarkas at the time of the Holocaust. My aunt tells me that her parents tried to convince the rest of the family to come to America, because Hitler had come into power in Germany and things looked bad in that part of the world. The family refused to leave because they had a nice home there and did not want to give it up. My aunt said that finally " their letters stopped coming"
She never knew what happened to them. Her parents gave up hope and burned up the letters years later. Now Jeffrey and I only know what she can tell us. My aunt is in her seventies now and with the passing of time memory can become faint. Your Web site on Yurburg, Lithuania is a blessing to us. I send her the section on the destruction of Yurburg so she would know what had happened so many years ago. It was hard on her, but I gave her a choice to know of not to know and she chose to know. My aunt indicates to me that her grandfather (the doctor) who lived in Jarbarkas name was Jacob Arenstein. She also indicates to me that he died a year or two before World War II broke out. We have searched Appendix Number 4 on your web site and think that Yudel Arshtein might be Israel's brother Julius. My aunt remembers that Julius was an electrical engineer by trade. In your web site Yudel was listed as an electrician by trade. Could the other brother Morris be Monik who is listed on the web site? The web site list them as brothers. The difference in Lithuanian and English may explain the difference in spelling. If our great grandfather (the Doctor) died just before the war is it possible that no monument had been placed at his grave site when the Germans sweep into town? Do you have any suggestions where we can search for additional sources of information ? Was a census conducted in that area around 1940 ? As I understand it all Jews were made to register once a year at their synagogue. The government would come around and copy the synagogue's record for their own purposes. Do you think that these records might still exist ? Do you known if we might find addition information at YAD VASHEM ? Any information or hints of places to research will be appreciated. Thank You for all your hard work in placing this information on the web. When I started researching I never imagined that the little town of Yurburg (Yerberig) would be even mentioned on the internet. What I found is so immense, the information stupendous. I don't not know why I didn't think to search the internet before for my husband's family who all came from Yurburg and Smalininkai ('Shmalenken'). I have begun the search and printed reams. Now to contact the people whose families came from Yurburg. Only three members of the Altman family got out of Europe before 1939. Eight others were murdered in 1941 in Yurburg. My husband, David Beirman, knew very little about his mother's family left in Yurburg after her parents and brother Shmuel, Perla (nee Berman) and little Myer sailed for Australia in 1929. Brother and sister William and Rachel Altman went to America in the 1920's. The Altman family I've located on your web site were murdered in 1941 in Yurburg. Their names are: Altman: Riva, Natan, Shmuel, Avraham, Hirsch, Fania, Chiene, Chume-Marie. Are any of these people mentioned anywhere? To my astonishement KOPEL ALTMAN from Kovno was found in Germany and placed on the Lithuanian Survivors List in 1946. He must be a cousin. I do not know how to trace him but have placed his name on various survivors lists. I am also trying to locate memebers (if any) of the Berman family from Yurburg. Isaac Berman owned the soda family in Yurburg.He died before the war. All the Berman family left Lithuania before the war. I cannot find reference to Berman the Tinsmith of Yurburg. Your web site is stupendous. I look forward so much to getting in contact with people whose families lived in Yurburg. This town was intriguingly special - I look forward to learning as much as I can. My name is David Beirman. My maternal grandparents were Samuel Altman who left Yurburg for Sydney in 1929 and my Grandmother's maiden name was Pera Berman whose family owned the Soda Factory in Yurburg. All the Bermans came to Australia before WWII. Two of my grandfather's family Rachel and Willy Altman left for Boston in the 1920s.I now know that 7 of the Altmans (my great uncles and Aunts) perished in Yurburg during the Shoah. I know very little about any of them . Your web site is a blessing and a glimpse into a past which was previously a mystery. My paternal grandfather was born in Yurburg - Bernard Rochco, son of Moshe Menachem and Henya Riba Rochco. His brother, my great uncle Israel Rahaza (Rochco) wrote a brief article in the Yurburg Yizkor book which has been very helpful in piecing together the family story. The surname was changed from Abramowitz by his father, who apparently owned a bath house (THE Bath House), and Rochco is similar to the word "to wash" in Hebrew, and from Abramowitz to Abrams at Ellis Island. I've heard also that the name was changed to avoid conscription in the Lithuanian army. My family was deeply moved by the picture on the website (picture Y26) of my great grandmother's (Henya Riba Rochco's) grave in the Yurburg cemetery. The ALD also lists my great grandfather's gravestone in the database, and I hope someday to visit Yurburg to visit their graves and the town in which they lived. Thank you so much for your work on the site and for the Translation of the Yurburg Yizkor book! It has been very moving and important to me and my family. Subject: Family from Jurbarkas, Yurbarkas in German: Georgenburg, Jurgenburg & Eurburg; in Yiddish: Jurborg, Jurburg, Yurburg, Yurberig & Yurbrik. Here's a story of four brothers. Two brothers of my MAGIDOWITZ family who originated in Jurbarkas etc (see subject line) went to Chester, PA and Buffalo, NY. It is possible that one brother (or both) changed the name from MAGIDOWITZ to DAVIS. One of these brothers is supposed to have had an English wife. Time frame circa 1905 - could have been a few years before. One of these brothers travelled from Jurbarkas to Leeds, England with my grandmother Zelda MAGIDOWITZ (later known as Jane) b. abt. 1889. She stayed in Leeds and married my grandfather in 1907. The man she travelled with was her uncle. Her father's brother. Her father was Azriel Zelig MAGIDOWITZ b. 1865 d. 1934 m. in abt. 1888 Esther b. 1869 d. 1941. Azriel Zelig had a wharf-side depot on the River Nemunas. Every time a boat came in, or went out, he was entrusted with valuable parcels, money, etc. whatever that was to be delivered in Jurbarkas. It was a job that his father (Benjamin) before him had done. In the warm summer months, Azriel Zelig's wife Esther, ran a kiosk with sandwiches and drinks, on the wharf. The fourth known brother Aaron (Orzig) MAGIDOWITZ m. Ethel Raizel (b. c. 1872 d. c. 1936) lived and died in Jurbarkas but his descendants might have travelled to USA. I would appreciate anyone with any thread of information writing to me. This site is hosted at no cost to the public by JewishGen, Inc. and is part of the ShtetLinks Project. If you find this site of value, your Jewish Gen-erosity is greatly appreciated. If you found this Shtetlinks site helpful, we would urge you to help support the work of JewishGen by contributing.